How do I calculate how much tubing I need for my hoop? I make hoops from 3/4″ 160 PSI black tubing found at Lowes, what size of LED tubing is similar? 3/4″ black tubing, will it feel and react the same? No. Although they are dimensionally the same the LED white tubing is more dense which means it will feel stiffer than the 3/4″ black tubing. You cannot rely of the PSI rating alone since they are made from slightly different materials. How much will the hoop weigh? A completely assembled larger 0.814″x1″ LED hoop with wires, LEDs, switch and non-rechargebale battery will weigh 1 lb 4 oz. The rechargeable version weighs only 1 oz more. A hoop made with thinner tubing 0.6×0.75″ would weigh only 13 oz. For comparison a standard 40″ hoop made with 3/4″ 160 PSI Black tubing is about 1 lb. What does the tubing look like? How do I collapse this hoop? When using a more stiff tubing, these hoops collapse by disconnecting the ends and spiraling it down to no less than 20″ diameter in size. When spiraling down the large 0.814×1″ tubing you will have to use packing tape or straps to keep it coiled up. The spiral shape is similar to the photo above. I cannot guarantee it can twist into a figure 8 shape like other collapsible hoops. Some customers claim it works, but I do not recommend it with this stiff tubing. To make a hoop that easily collapses into a figure 8 and folds in half please click here to read about the new Flexible Tubing. Tests vary. For the non-rechargeable battery will last about 5 – 6 hours if it were run continuously. But when used intermittently, about 20 minutes at a time, it can last 8 hours. The rechargeable battery shines very bright for 3 continuous hours, but can total 5 hours if used intermittently. Can I use CR2 batteries instead? They will fit in the 0.814×1 inch size LED hoop but you may need to use resistors in your circuit to handle the higher 6V power you will be supplying the LEDs. What does the color changing LED look like? There are new LEDs in the kits that are multicolored slow changing and look like this video below. What will the finished hoop look like? In my last workshop at the Maker Faireit only took about 2 hrs with my direction. Most of the people involved had no prior experience with LEDs, electronics, or soldering. 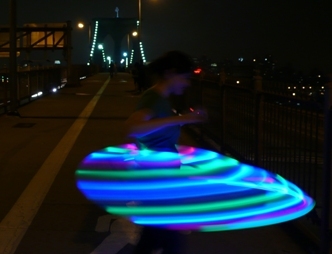 This still looks hard, can you make the LED Hula Hoop for me? Yes. Go here and select a ProdMod Certified Maker to assembly your custom hoop. This seems pricey, can’t I just buy these parts myself? Yes you can. But you will be ordering from a handful of different sites each charging you shipping. And some parts have to be purchased in bulk in order to get better pricing. So buying all of your parts from this site will save you money. Are the color changing LEDs synchronized with each other? No. They are NOT synchronized! (yet)Each color changing LED has its own chip inside the bulb. Each color changing LED will change colors at its own pace. It may seem to be synchronized when they are first switched on, but they will soon fall out of sync. Watch the “Finished Hoop” video above to see what this looks like. *if you are interested in synchronized LEDs you can check out my new video and contact me if you are interested. Will the hoop be weight balanced? It depends on how balanced you need it and how much work you are willing to put into it. There is only one battery located near the connector. This is done to make hoop upgrades easy. It is a very lightweight battery at only 1.6 oz but its true that more weight will be near the connector. Most hoopers do not notice this 1.6 oz, but a small percentage (1%) of my customers do feel it when they do tricks. To counter this imbalance you could tape a dead AA battery to the LED wire opposite your battery before you slide it into the tube. You can also add more tape on the other end as well. Do I have to tape my hoop? You should tape over the connector where the two ends of the hoop meet to ensure nothing opens during hooping. You can also feel free to tape the entire hoop leaving room for the LEDs to shine through. Most people use a spiral pattern of tape. Without tape the LED hoop can feel very slippery. It is recommended to use sandpaper to rough the inside of the hoop for better grip. I purchased your AA battery kit but bought my own LEDs. I have red, orange, yellow, green, blue, ultra violet and white LEDs with a 7-color strobing LEDs in between each color. When I wired everything together and turned it on, the red, orange and yellow LEDs lit up as well as ALL the strobing LEDs but nothing else. I am working on this project at a hackerspace and someone told me that I probably need a more powerful battery and resistors to get the green, blue, ultraviolet and white to light up. Were your kits designed to be used with only the LEDs sold on your sight? I am just trying to decide on the next action I should take to try to get this all to work. Thanks! My kits are designed to work with the colors offered on my site. If you are trying to use red, orange, and yellow you need to use resistors with them. 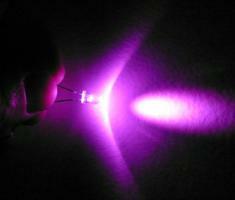 They run on a lower voltage than the other colors like blue, UV, and white. I have built blue, UV, and white hoops with the AA kit without any problems. But I have not combined red, yellow and orange. Are you using resistors with all colors? or just some of the colors? Did you follow my tutorial on how to connect everything? I think I’ve come up with some solutions to make your kit still work for me and since you seem like you know quite a lot about electronics I thought I’d try to run it by you to see if you think it all makes sense. I’ve been doing some research (keep in mind that I am just beginning to learn about electronics) and I think the AA kit even boosted up to 3.3v is not enough for the leds I bought based on this page I found that shows the wavelength and forward voltage (http://www.oksolar.com/led/led_color_chart.htm). It turns out that even my green leds are 525nm which needs 3.5v to light and the blue, uv and bright white need even more. So it sounds like I at least found my problem. Further research has led me to find the 28a 6v batteries often used in cameras. Unfortunately there does not seem to be a holder you can buy for that battery BUT I found an instructable where someone cut the middle out of a normal AA case (like the one I got from your kit) and the 6v fits nicely inside now. I have also calculated the resistors I will need to use with each color so in my mind it sounds like this could all work. Does that sounds logical to you? Thanks so much for any help you can provide! I know you have to explain a lot of things to us newbies quite often! Can you tell me what size (in mm) your LEDs are? Are they compatible with 5mm LEDs? Simply just desired to say I’m thrilled I happened onto your website!. Man is certainly stark mad; he cannot make a flea, yet he makes gods by the dozens. Have visited once, 100% would visit It was an awesome experience!